The Institute of Northern European and Baltic Languages and Cultures (SNEB) is glad to announce the start of the International Master in Sociolinguistics and Multilingualism (SoMu), a joint degree master study programme co-organised by the Johannes Gutenberg-University, the Vytautas Magnus University (Kaunas, Lithuania), the University of Tartu (Estonia) and Stockholm University (Sweden). SoMu is the first study programme in Europe focusing on the social aspects of language use and multilingualism in the entire Baltic Sea region. “In this programme we do not concentrate on multilingualism in the terms of national languages and the languages that have an official status in the European Union, but we rather pay attention to the diversity of languages, some of which belong and some of which do not belong to the ‘standard package’ of languages taught in schools”, says Anneli Sarhimaa, the Professor of the SNEB. She and Nora Kruse, the DAAD financed SoMu programme coordinator in Mainz, just returned from Kaunas where they together with colleagues from the partner universities welcomed the first generation of the SoMu students who started their two-year studies the 1st of September. 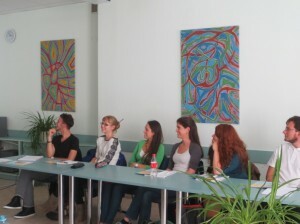 In the summer semester the students will study in Mainz. The third semester they will spend either in Tartu or in Stockholm, and the fourth will be studied at the university of the main supervisor of the MA thesis. The first SoMu generation consists of eight students, out of who five have their BAs from different Lithuanian universities, two from Germany and one originates from Kazakhstan but holds a Bachelor Degree from the University of Pennsylvania. As pointed out by Professor Ineta Dabašinskienė in her welcome speech in Kaunas, “having eight students in the first cohort actually is a very good result for an international programme, especially considering that we only had six weeks for advertising for the programme in May and June 2013.” Furthermore, SoMu managed to attract the attention of students from at least twelve different countries, including countries outside Europe, such as Ethiopia and India. Given that there are 52 weeks till the next application deadline, the SoMu team optimistically believes in a notable increase in the number of students in 2014. The Kaunas team will conduct a targeted advertisement campaign in the Eastern European countries later this year. The Mainz, Tartu and Stockholm teams will seek to cover the West. A detailed media and advertisement plan will be established within the next eight weeks. Beside the official website, SoMu can already be found on Facebook, and Youtube presentations are just about to follow… As the SoMu students have already promised to actively contribute, we will definitely be able to tell you more about the advertisement campaigns in the next newsletter! Two information events have already been scheduled for Mainz. The first one will take place on December 5th at 4pm in lecture room P204, the second will be given on February 4th at 2pm in lecture room P11. The international SoMu Steering Team will meet in Mainz on December 5th and 6th to discuss the experiences of the first semester and to plan the future activities. One of them will be the SoMu symposium on heritage languages and identities: On May 22nd and 23rd, 2014, guest experts as well as the students and the teachers of the SoMu programme will meet to present and discuss their research projects in Mainz.